It took thirty long years to realize the dream…but so worth the wait. I just want to encourage all the writers out there with the same dream to never give up on it. I can remember trying desperately to come up with intriguing plots for many years. However, I realized that sometimes we just have to wait for the right timing. My inspiration came after my father’s death twenty years ago. He was a pathologist and was diagnosed with early-onset Alzheimer’s when he was 56. He looked young and healthy, but it was a deceiving camouflage that hid the insidious disease that was robbing his once, bright mind. After his death, nine years later, I found myself in that common position of needing to explain the natural cycle of life to my two young sons. I was walking on the beach in 103 degree heat. I kept visualizing the image of a melting snowman family who return in the form of happy raindrops together again. My mind was so deep in thought that I walked way, way, way too far from where I was staying. I found myself parched and weary, having lost all sense of time and distance. However, I was ecstatic because the creative process had, at long last, produced for me. I spotted a lady on her deck and I asked if I could use her phone to call my mother. When my mother drove up to rescue her distracted daughter, I jumped in the car and said, “I finally have the idea for my first book!” The Everlasting Snowman—a story of the cycle of life—was birthed at long last. The artist, Tamara Scantland Adams, did an excellent job of bringing the words to life with beautiful watercolor illustrations. It is a book that has a universal message of loss –an aid in grief resolution. It is a book for children, but also for the adults holding them by the hand who need the comfort, as well. 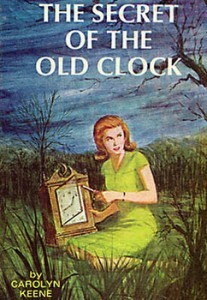 Thank you, Nancy Drew, for being the catalyst for igniting my wonderful career and fulfilling my dream that began as a child. I have written a total of eight books and have another children’s book that should be out by the end of the year. I feel so fortunate. I am certain my father would be pleased and is smiling down from heaven. I hope that my message will encourage other writers with “the dream” to never give up on it. If you love words…you can make your dream come true, too. Personalized copies may be ordered by visiting www.booksbyhunter.net.